Me and the Little Rascals: My Last Project of the Year!! Hi everyone!! I hope you all had a fabulous Christmas. I'm still recovering...I ate waaaaaay too much, and now I'm actually looking forward to getting all the junk food out of the house. The diet starts tomorrow!! (and I say that every year, lol) I can't believe that 2010 is almost over, it just went in a blur, and I didn't do half of what I was going to. It has been a great year for us though, and we are totally loving our "sea change", although we have hardly been to the beach at all lately because of all this rain. If you read my post over at Imaginisce, you'll know why I love these things!! And, if you'd like to win them, all you need to do is be a follower on both my blog and the Imaginisce blog, and then leave me a comment here. Too easy! I'll announce a winner on the 2nd of January. Well, I hope you have a safe and Happy New Year!! See you in 2011!! Love this album...love your work! I am a follower of both blogs already. Thanks for the inspiration and the chance to win. Happy New Year and well wishes to you and your family! Love this album! Great style! I am a follower of both. Thanks for the giveaway and for sharing. 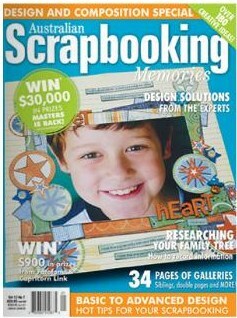 I'm more a digiscraper but love the original scrapbooking experience better ;-) it's just a matter of room, budget ... So I love this opportunity to win supplies: Thank you !!! I love this album Sam, it is so colorful! I am already a follower at the Imaginisce blog and now I am a follower of your blog! Love the album. How cute are those paper banners. I'm already following on Imaginisce & now I am following you too. TFS! What a great album. I've rediscovered minis lately and plan to do more of them next year. I am a follower and what a super cute album.. Love it.. I follow both of these blogs and I love this cute book. I have many birthday pictures at the bowling alley so I would love to win so I could make a book just like yours since I love it! I am a folower of both blogs. That is a super cute album. Love the album! And you finished in plenty of time, lol. Awesome album! I am sure you are glad to be done before his next birthday! Love your giveaway! Thanks for the chance! I am a follower of both blogs! I love the mini album! that is my favorite type to create! and birthday bash paper and embellishments are so cool! I have loved them from the beginning! Your mini album is too cute. Love all the details. I am a follower of both blogs. Thanks for the chance to win. Happy New Year!! love your mini album, tfs! I have become a follower and I already am a follower of Imaginisce's blog. Your mini album is beautiful Samantha. Happy New Year girl! Just found your wonderful blog though Imaginisce. I can't believe I never have been here before! I am a huge fan of Imaginisce and also Pinky's and now YOU too! LOVE your board book, especially the big bold words on the end of each page. I am now a follower (under the name of buckskinbelle) and have been a follower of Imaginisce for a looooong time. Happy 2011 to you and your beautiful family. I am a follower here and there! Your mini album is fantastic. I follow both you and Imaginesce. Thanks and Happy New Year! oh wow...you + bday bash = UH-MAY-ZING!!!! great album...thanks for the inspiration!!! Just love your album and I just love the way those papers look too! I am a follower of both your blog and the Imaginisce blog and I totally understand why you love those products! Happy New Year.....have an awesome 2011! Have been a follower of both blogs for a while now .....Happy New Year Sam hope 2011 is filled with Good health Love and lots of great memories. love the mini album! already a follower of both blogs. Happy New Year and thanks for a chance to win. Love your mini album! I'm already a follower of Imaginisce, and I'm a new follower of yours. Thanks for sharing! I am a follower of both your blog and Imaginisce. Birthday bash is a terrific collection and I love how you used it in your son's birthday mini album, awesome job! Happy New Year and thank you for a chance to win. I am a follower and I love your album! Those colors are amazing! What a lovely memory of your son's 9th birthday! Saw this earlier...loved it then....love it now! Fantastic album! I love it, TFS! The colors really jump right out at you. That mini is really special. I love it!! What a bright rockin' mini album.. love your style. I just became a follower of yours. Happy New Year! Love your mini album! I've always wanted to make one...maybe this will be the year! I love minis and you have done a great job here! I am a follower already of both blogs, so thanks for a chance to win! You did a great job on your mini album! Jack is going to treasure it for the years to come. I am a follower of both your blog and the Imaginisce blog. Love your album! This album is adorable - definitely inspiring! Love this album it is adorable. Thanks for sharing your mini book with us, it is adorable as is Jack! I would become a follower if your link was available.... It is just blank under followers. love the bright colors... for boys & girls!! That album is just so cute! I'm hoping I can do something like that for my grandkids' birthdays! Thanks for a great idea. And I am already a follower of both blogs! Love the album, now I wanna do one for my daughters first birthday that just passed! Super cute album Sam! Congrats on making the DT again for Imaginisce! Happy New Year! Fabulous album. I am now a follower on your blog and have been of Imaginisce for a while. Thank you for the chance to win some goodies. Have a great 2011.